For 30 years, supermodel Linda Evangelista has been known as one of the most beautiful women in the world. But even someone with that kind of track record can struggle with their skin. Recently, I got the chance to chat with the iconic cover model. (I may or not may not have been physically trembling before I picked up the phone.) Our interview was in honor of Evangelista’s partnership with Erasa, a revolutionary skincare brand that makes just one product: a science-backed anti-aging concentrate that the 51-year-old swears is the only thing that cleared her skin of a condition she battled for two decades: melasma. According to celebrity esthetician Renée Rouleau, melasma is a chronic skin condition where brown spots appear on the face, and it’s caused by a complex combination of “age, sun, and hormones.” Skincare experts agree that there is technically no cure for melasma, but Evangelista swears that Erasa’s XEP-30 has cleared her skin better than anything else she’s tried. The product contains a combination of neuropeptide technologies, including collagen boosters and anti-inflammatories, which primarily target wrinkles—but I can tell from Evangelista’s passionate tone of voice that for her, the product did much more. During our conversation, Evangelista spoke at length about her melasma struggle, her past skincare mistakes, and her honest feelings about the aging process. Keep scrolling to read Linda Evangelista tell her story in her own words. LINDA EVANGELISTA: “My melasma popped up in my early 30s. It happened suddenly. I remember I had a tennis match, I went to the restroom, and as I was washing my hands, I looked in the mirror and saw what appeared to be dirt above my upper lip and cheeks. I tried washing it off, but it wouldn’t budge. I had no idea what it was. I should’ve been better educated. I knew that it ran in my family. My grandmother had it and so did all my aunts, and my mom a little bit too. But on them, I thought they were age spots or liver spots. “The strange part was that the melasma escalated so quickly. I had these very dark spots on my upper lip, my forehead, and my cheek. I panicked—I was wearing sunscreen, so I had no idea why it came right out of the blue. At first, I thought it was payback for the suntanning I did when I was younger. I would get all baby-oiled up and place aluminum foil on a piece of cardboard to get a better suntan. Then I battled it for years and years, hiding from the sun, wearing scarves around my face and hats—as you’ll see in photos, I’m always in a hat. I also did so many rounds of peels, but those things do a number on your skin. I used to have what I thought were really nice beauty marks, but they are all gone from the chemical peels I did. Plus, you have to be careful not to anger melasma; it just doesn’t like being messed with. You might infuriate it and make it flare up even more." “This was an ongoing battle from the time I was 32 or 33. It was only when I started playing with Erasa that I saw something positive finally happen. I want to say it’s 85% gone now. For me, the product is incredible. I know that it has such great success because people love what it does for your wrinkles. But personally, I couldn’t care less about the wrinkle part—I’m just ecstatic about what it did to my skin tone. I’m not suffering like I used to. I’m not terrified to go outside, and when people are talking to me, I don’t feel like people are staring at my melasma. “Wearing sunscreen diligently for 20 years has been the best thing I’ve ever done for my skin. And I haven’t suntanned in 20 years. It makes me very sad to see people deliberately suntan. Family members of mine do it, and it makes me so sad that everyone has this idea that you look better with a tan. Now when I see people with a suntan, all I see is that they were stupid enough to let radiation enter their skin, and why would anyone want to do that? “Sometimes people ask me what my all-time favorite shoot was. It’s this story I did in Miami with Steven Meisel for Italian Vogue—it was called ‘Cuba Girl,’ and my skin was a mahogany color. That was not makeup, that was my suntan. I think I was 22 or 23, and I thought I looked just fabulous. “In my 30s, I started seeing everyone around me getting Botox. By then, I thought maybe that I had waited too long to hop on the bandwagon—that I was too old to start. I feel like that’s another thing that we stress too much. 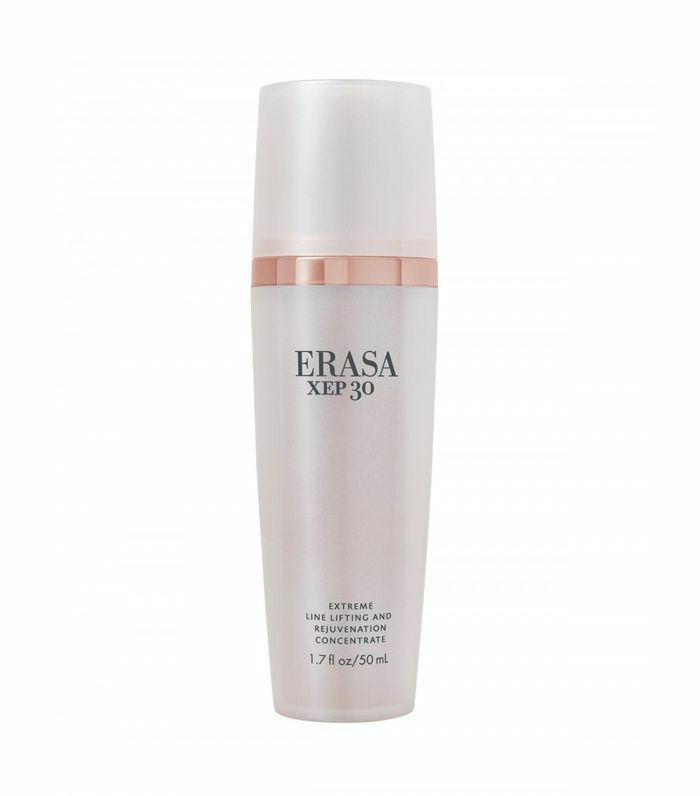 I know Erasa is an anti-aging product, and it really does make my skin look younger, but the fear of aging is something I just don’t get. I really look forward to aging. I don’t know if it’s because I have a child and want grandchildren one day, or because I have had so many friends and family die so young. Shop Linda Evangelista's melasma cure below! Loving our celebrity exclusives? Next up, don't miss our interview (and stunning photo spread) with Lucy Hale.